Download our resources PDF here. “What Kills Birds?” Curry & Kerlinger, Inc. Stray Pet Advocacy, How Much of an Impact Do Cats Make on Wildlife? Vox Felina http://voxfelina.com/ Providing critical analysis of claims made in the name of science by those opposed to feral/free-roaming cats and trap-neuter-return (TNR). It is worth it to spend a little more and avoid the cheap traps that can be purchased from local feed & seed stores or home improvement stores. 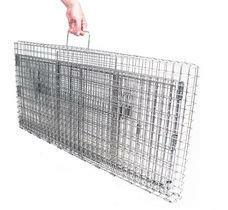 Avoid collapsible traps – a cat that is thrashing around can cause it to collapse! Two-door traps are best – one end should have a sliding door. This allows for easier trap set up, easier care of cats during the time they are being held, and is needed for use with drop traps. Makers of the “Fat Cat Traps” (in addition to regular traps), and all have a larger trip plate so there isn’t a need to cover the trip plate when setting the trap. 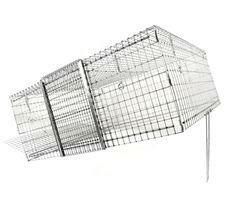 Can purchase matching trap dividers and transfer cages. The Fat Cat Trap does not work for small kittens, but their smaller size traps do. Safeguard traps – be sure to get a two-door trap (“slide release back”). 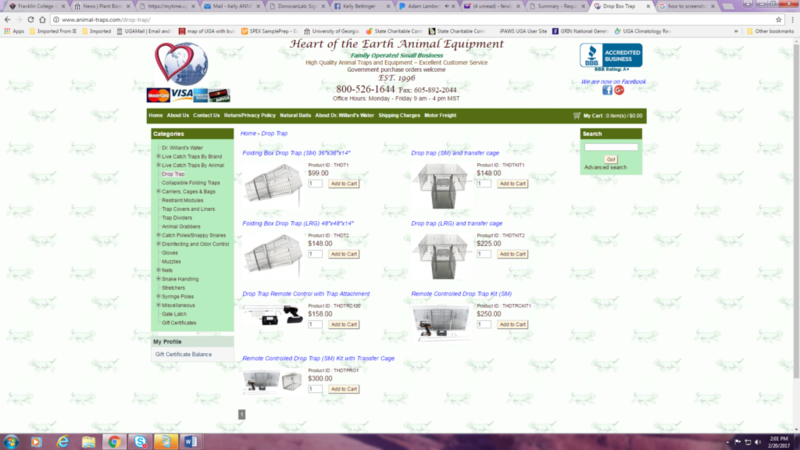 Can purchase matching trap dividers and transfer cages. 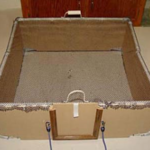 Havahart traps – buy the trap designed by Neighborhood Cats that has two doors and an extra large trip plate. 36” is model 608NC, 30” is model 606NC. Tomahawk traps – remote control accessories available. A drop trap is a more sophisticated version of the old box propped up on a stick with a string attached. When a cat goes under the “box” to reach the bait, the trapper yanks the string (or pushes a remote control button as the case may be), causing the trap to drop down over the cat. We call it a “trapper’s best friend” because it is great for catching cats who absolutely refuse to enter a normal box trap no matter how hard you try to tempt them. The reason a drop trap works so well has to do with cat psychology. A feral cat is naturally wary of entering the narrow, closed confines of a regular box trap, which is why you have to withhold food the day before a trapping – to get him hungry enough to overcome his fear and go in after the bait. But cats do not fear going under something. Most will go right under a drop trap with little hesitation. Their lack of fear also means they don’t have to be extra-hungry to lure them in. If you just don’t feed that day, you’ll usually be ok.
Drop traps are good for more than trap-shy cats. If you need to pick out one cat from a crowd, you can leave a big bowl of bait, let other cats come and go, and wait until your target arrives before dropping the trap. This kind of selective trapping might be desirable if you’re after young kittens, a pregnant female, an injured cat or the one colony member you missed when you trapped the rest. At Neighborhood Cats, we like to break out the drop trap towards the end of the first day of a mass trapping when there are just a handful of cats left milling about who won’t go in the regular traps. It can save having to come back for the holdouts the next day. Neighborhood Cats teamed up with Tomahawk Live Trap to design the first mass-manufactured drop trap, making this kind of trap easily available and affordable. It’s all metal, folds up flat in a suitcase style and has an optional remote control. 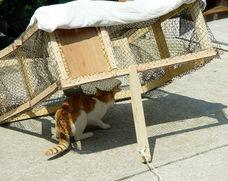 A sliding door on the side allows for transfer into a box trap with a rear door, transfer cage or feral cat den. Order Model DT1 from Tomahawk Live Trap. For step-by-step instructions on how to set up and use the Neighborhood Cats Drop Trap, read our guide. Many of the instructions apply to make-it-yourself drop traps as well. One word of caution worth emphasizing – don’t use a drop trap for the very first time on that female cat you’ve been after the last five years. Practice once or twice on cats you’ve already fixed, including dropping the trap and transferring out into a box trap. If that’s not possible and you still need a volunteer, try your pet cat in exchange for a treat or two. After you’ve gone through the process and made any learning mistakes, then you’ll be ready for prime time. If you’re handy and know basic woodworking skills, you can build your own drop trap. 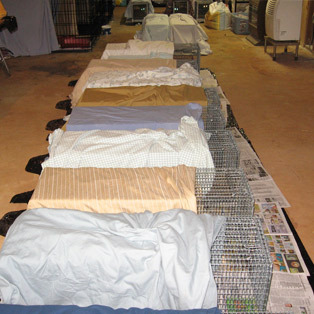 Laura Burns, one of the pioneers of using drop traps for TNR, has provided instructions on how to construct a non-foldable drop trap out of wood and netting, For other designs, including traps made out of PVC pipes, visit the Drop Trap Design Bank where you’ll also find video of a drop trap in action. Making a drop trap that collapses and folds flat is more complicated and requires more construction know-how. Be sure to contact each clinic ahead of time to find out what days/times feral cats can be brought in, whether or not an appointment is required for feral cats, cost (always ask if there is a special deal happening! ), what type of payment is accepted, etc. 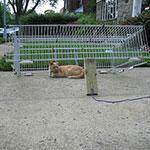 All clinics require feral cats be brought in traps – no feral cats in cat carriers! Services are available at their main clinic in Winder as well as satellite clinics in Dalton and Elberton. Reduced cost spay/neuter for companion pets and feral cats. Clinics are in Avondale Estates and College Park. Free feral cat spay/neuter surgery in both DeKalb and Fulton Counties! Note: Proof of residency in DeKalb or Fulton is required. Also holds clinics throughout GA via their mobile spay/neuter vehicle. Check website for details. 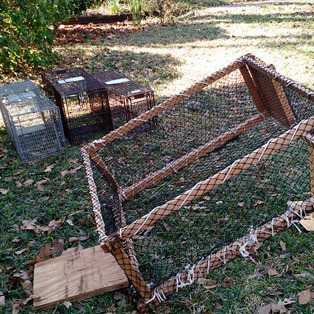 Discounted price for feral cats, traps are available for loan with a refundable deposit. You will often read that if you catch kittens over 8 weeks of age, they cannot be tamed. False! We have found that even “teenagers” – cats 3-8 months old – can easily be tamed. It might take more time, and they may never trust any humans other than those they live with, but these older kittens are often desperate for food and love if they have been separated and are lost from their siblings or mom, making them easier to socialize. 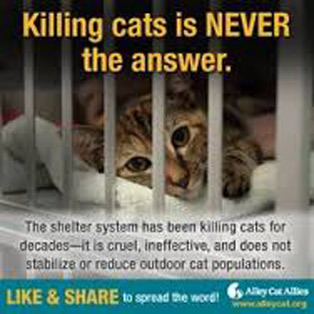 Many communities have rounded up colonies of community cats either for euthanasia or to relocate them to another area. This does not work, because community cats are very connected with their territory: They are familiar with its food sources and places that offer shelter, as well as resident wildlife, other cats in the area, and potential threats to their safety. Even when all community cats are removed, which is difficult to achieve, new cats will soon move in and set up camp. Relocation is something to consider only if keeping the cats where they are becomes a threat to their lives, such as their territory being demolished and there is no adjacent space to shift them to, or if the cats’ lives would be at extreme risk should they remain where they are. This guide is designed to help communities find long-lasting, non-lethal solutions to conflicts involving community (feral and stray) cats. The guide examines how typical conflicts can be mitigated and addresses proactive approaches as well as the importance of collaborative efforts in local communities. Concisely focused on what local leaders want and need to know, this guide is endorsed by the International City/County Management Association and while well-supported by the latest science is also easy to read and understand. The guide provides background on the issues, options for resolving conflict, and resources for more in-depth information and assistance. $10 hardcopy from HSUS or available for free download online.